A houseful of grandchildren is exciting any time, but the energy is never higher than at the holidays! Capture the fun and the love that is shared between generations with the 8 grandkids - loving hearts at Christmas personalized ornament that will sparkle throughout the season. Topped with a golden Christmas star and finished with a lovely holiday holly sprig, these grandparents ornaments personalized from Russell Rhodes will thrill the whole family. Provide us with the information you want to see, and an artist will add it where shown using stylish lettering to produce a custom keepsake enjoyed by everyone. 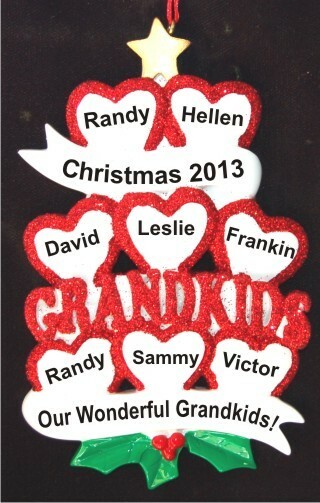 The stacked hearts 8 grandkids personalized Christmas ornament arrives in our classic velvet gift and storage pouch ready to display.